The 22 villages in the Brahmapuri Forest Division of Gadchiroli district of Maharashtra are planning to take their judicial battle against the Forest Development Corporation of Maharashtra Ltd (FDCM) a level higher. The villagers have decided to present a Civil Appeal in the Supreme Court under Section 22 of the National Green Tribunal Act, 2010 (NGT), against the orders of Tribunal’s Principal Bench of July 24 this year. 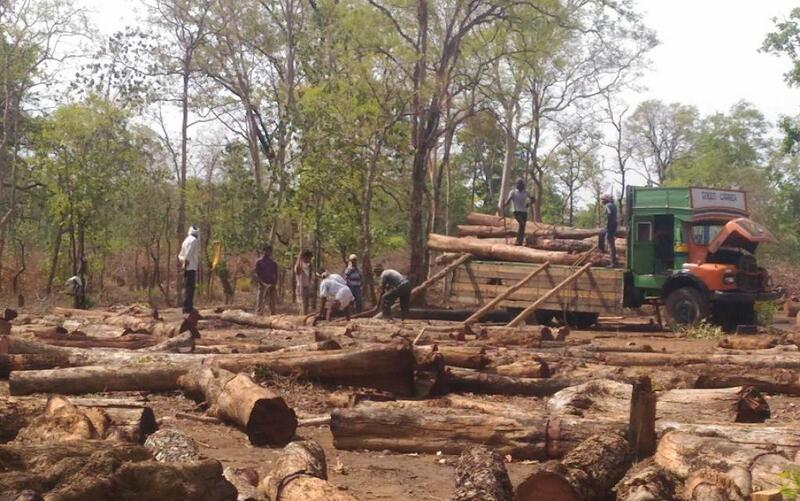 The villages are challenging the FDCM’s decision under which it felled 385 hectares (ha) of the old-growth forest to raise teak wood plantations in the area in June 2016. The communities in the area were traditionally dependent on the Brahmapuri forest for food and livelihood. At least 12 villages filed community forest resource (CFR) rights claims under the Forest Rights Act, 2006. In 2011, the Vihirgaon gram sabha had filed CFR rights claims over 312 ha of forests in its customary village boundary. But it received title deed over 252.56 ha. While the gram sabha's appeal to review the title deed is pending with the State Level Monitoring Committee, the forest department in 2014 allotted the remaining area to the FDCM. The body started felling trees with scant regard for gram sabha resolutions against its activities. Moreover, most villages in and around Brahmapuri forest division are governed under the Panchayat (Extension to Scheduled Areas) Act, 1996 (PESA), where gram sabhas have the right to manage forest resources. PESA requires that no activity in the traditional boundary of a village can be carried without the consent of the gram sabha. But FDCM did not inform the gram sabhas before felling trees in Brahmapuri forests, let alone seek their consent. In fact, in a letter to the tehsildar of Kurkheda, FDCM stated that the protesting villages, including Sawalkheda and Shirpur, are not governed under PESA. Activists say FDCM's claim is false. To assert their rights, Sawalkheda residents in April 2016 confiscated FDCM’s wood-cutting machines and lodged a police complaint against it. Instead of recognising the rights of the gram sabha, the police made Sawalkheda residents write a declaration that they would not disrupt the corporation's activities in the future. The villagers had initially filed a case in the Bombay High Court in April, 2016, raising the issue of deforestation being conducted by the FDCM in the villages, especially in Compartment 83-A and 83-B as well as in the villages of Desaiganj, Kurkheda, Armori and Vairagad in Gadchiroli district. They had also highlighted the violation of the National Forest Policy, 1988; Scheduled Tribes and Other Traditional Forest Dwellers (Recognition of Forest Rights) Act, 2006 (FRA) as well as the Panchayats (Extension of the Scheduled Area) Act, 1996 as the activity of felling trees was affecting the rights of the communities who have been dependent on such forests for the purposes of their livelihood. The High Court transferred the case to the NGT in June of the same year. The case was heard by the NGT’s Pune Bench, which gave the direction that the status quo be maintained in November 2017. However, due to non-availability of members in the Pune Bench, the matter was transferred to the Principal Bench of NGT on February 24, 2018. The NGT, in its order of July 24, had stated that the Management Plan for the Bramhapuri Forest Division was approved back in 2015 and that the Tribunal cannot interfere with the said Management Plan. Now, the villagers are going to approach the apex court to seek justice.